Louis Comfort Tiffany continued the tradition of offering unique jewelry the patrons of Tiffany & Co. had come to expect when he took over the company in 1902 after his father, Charles Lewis Tiffany, had passed away. His vision for expanding the company's adornment business was different, however, than the elegant extravagance of his father's era using precious jewels obtained from European royalty. Tiffany's "art jewelry," as L.C. Tiffany referred to it, largely reflected the themes and styles popular during the Art Nouveau movement, the hand craftsmanship of Arts and Crafts wares, and elements gleaned from exotic objects he admired, and these melded beautifully together. Louis Comfort Tiffany ensured that the colors and Art Nouveau style that made his glass a form of artistry would be transferred into wearable creations. According to the Charles Hosmer Morse Musuem, he used primarily semiprecious stones and enameling in the 750 art jewelry pieces sold through his family's business. Tiffany's newly established art jewelry and existing enameling departments were closely linked as each piece of jewelry was designed and crafted with impeccable detail. The enamels were formed using a glass-like paste applied to metal and high heat, a process the company perfected in 1898 and also used on Tiffany's Favrile wares. These enamels offered color options for jewelry manufacture outside the norm. While Louis didn't actually create the jewelry, it was produced by talented jewelers under his supervision and some, like the peacock necklace shown above, were produced from his own design sketches. The peacock necklace was crafted by jeweler Julian Munson (Sherman) for exhibition between 1903 and 1906. It is now a part of the Tiffany jewelry installation at the Charles Hosmer Morse Museum of Art in Winter Park, Florida. Comprised of enamel, opal, amethyst, ruby, sapphire, demantoid garnet, emerald, chrysoberyl, and gold, this is the most important existing work in this medium. The front medallion features a peacock mosaic of opals and enamels surrounded by amethysts and sapphires. According to the Morse Museum, exhibition pieces like this one were finished on both sides, and the back of this necklace features an enameled design of pink flamingos. This photo shows the back of the peacock necklace featuring intricately enameled pink flamingos. This exhibition piece was designed between 1903 and 1906 by Louis Comfort Tiffany and crafted by jeweler Julian Munson (Sherman). It is displayed as part of the Tiffany jewelry installation at the Charles Hosmer Morse Museum of Art in Winter Park, Florida. While the jewelry, art jewelry in particular, produced under Louis Comfort Tiffany's direction makes up a fraction of the work he is known for, this medium is significant nonetheless. In fact, Tiffany himself referred to each one of his designs as "a little missionary of art." His art jewelry exhibited mastery in incorporating the flowing forms and natural elements of Art Nouveau style just as he had previously conveyed through leaded glass lamps and windows. He was greatly influenced by the handcrafted jewelry of the Arts and Crafts movement made with colored gemstones as well, according to press information shared by Tiffany & Co. While the art jewelry itself imparts the flair of European manufacture, many of the motifs are distinctly American. These include blackberries, wild grapes and flowers, and other natural themes inspired by floral and fauna Tiffany found on the grounds of his majestic Laurelton Hall home on Long Island, where he actually held an annual "Peacock Feast." He - along with a talented team of designers, jewelers, and enameling specialists - captured these elements of nature in wearable art forms using varied metals and vivid enamels along with colored precious and semiprecious gems. 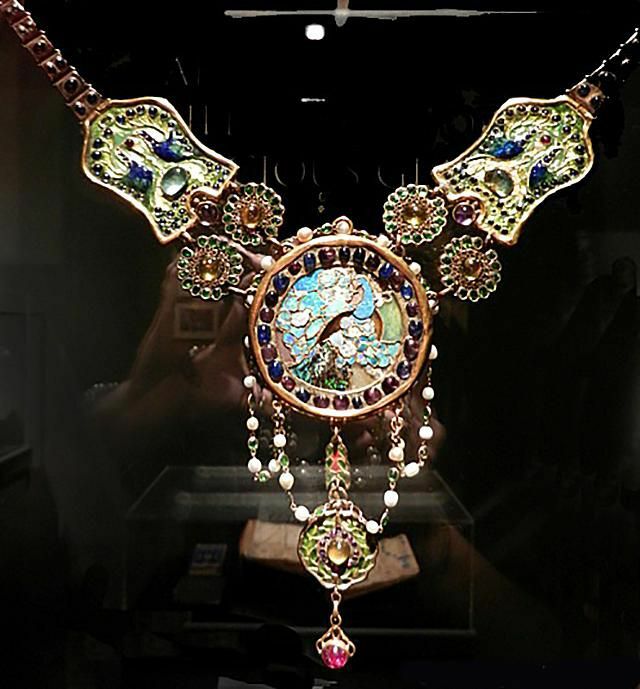 The peacock necklace is a prime example of this artistic expression. Tiffany also drew on the influences of Etruscan, Egyptian, and Moorish art he studied earlier in life during his travels in Europe and North Africa. He collected jewelry along the way ranging from ancient Greek earrings to Babylonian necklaces. Elements of these pieces, such as braided or twisted cannetille wirework first used by the Greeks to allow gemstones to be set into open spaces, can be found in some of the designs Tiffany sketched himself as well as the renderings of those who worked alongside him. A number of different enameling techniques considered to be "antique" in nature even in the early 1900s, including cloisonné, basse taille, champlevé, and plique-à-jour, embellished many pieces of Tiffany's art jewelry. Plique-à-jour enameling actually resembles stained glass, making it a near a perfect medium for jewelry associated with a glass master who valued the influence of light in his work like Tiffany did. Of course, the 750 pieces of art jewelry produced make up a small portion of the overall body of jewelry designed and sold through Tiffany & Co. at Louis Comfort Tiffany's direction from 1902-1918. Many were traditional contemporary jewelry styles in continuation of his father's vision for the company. The photo above offers a rare glimpse at a Tiffany jewelry design book on display as part of the Tiffany jewelry installation at the Charles Hosmer Morse Museum of Art in Winter Park, Florida. The book dating from 1914-1933 belonged to designer Meta K. Overbeck who began supervising Tiffany's jewelry production in 1914. This book of design renderings - featuring drawings in watercolor, ink, and pencil on paper - is in itself a work of art. What is a Pavé Stone Setting?